Help family in raising funds for Nevil Roy's liver transplant. This is an appeal on behalf of Nevil Roy, aged 12 years and his family. 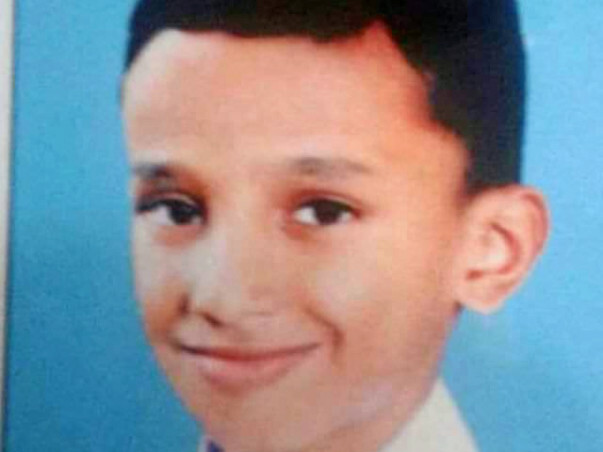 Nevil is a student of 7th standard at Holy Family UP School, Kanjirapuzha, Palakkad district, Kerala, India. Nevil was diagnosed with jaundice five months back and has been undergoing treatment in different hospitals for it. Finally on 27 November 2017 he was moved from Government Medical College, Calicut, Kerala to Amritha Hospital, Cochin, Kerala. Nevil's condition has worsened and doctors have advised that he needs to undergo a liver transplant at the earliest . 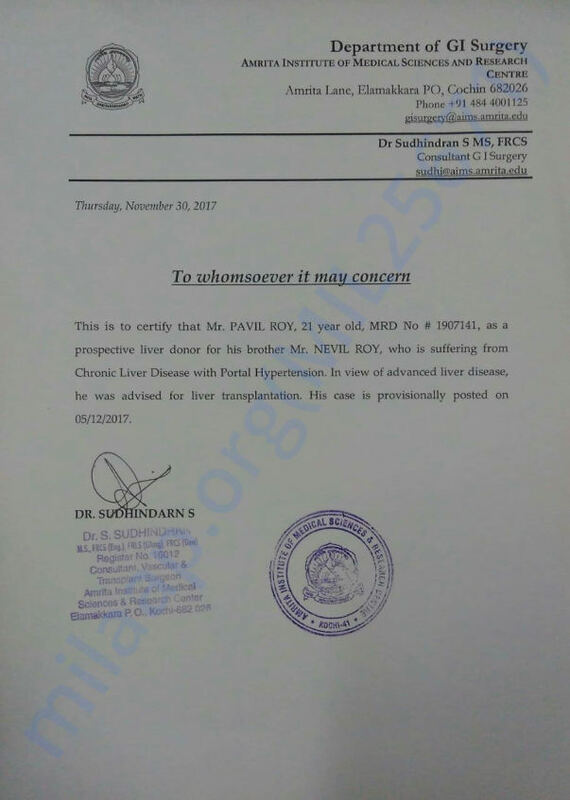 His brother Pavil Roy is ready to donate his liver and has been tested to be fit for the transplant. The total cost of liver transplant and after care for both Nevil and Pavil is coming to be around 35 lakhs. 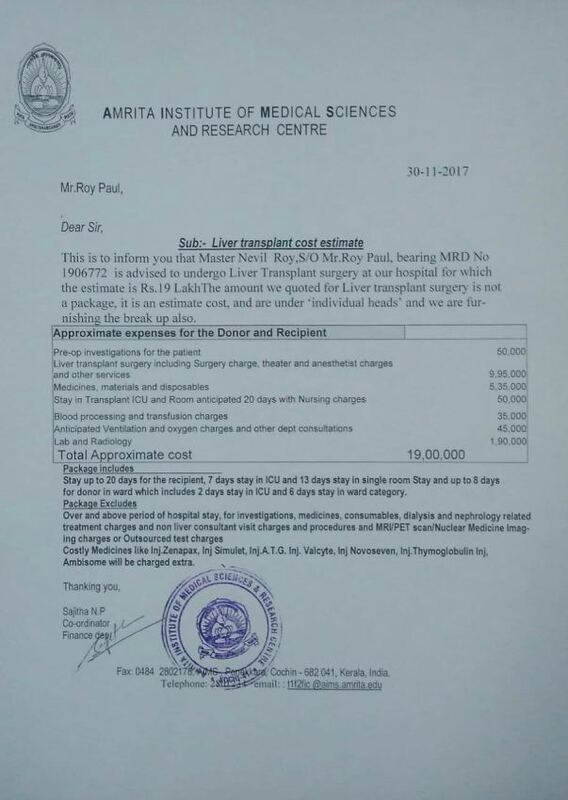 Hospital requires around 18 lakhs for the surgery itself. Nevil's parents are poor marginal farmers and have exhausted their funds and has already taken loans for the treatments so far. We request all compassionate and benevolent minds to contribute towards Nevil's medical fund and help the family see their sons get back to normal life. Posting Words of gratitude from Nevil's family and the people of Kanjirapuzha. 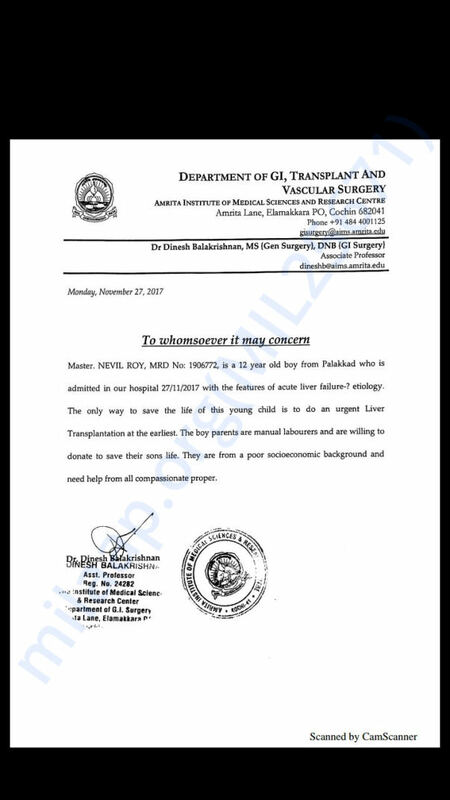 With utmost gratitude, we the Nevil' family and the people of Kanjirapuzha express our sincere thanks to those people throughout the world who joined hands with us, without any distinction of class, caste or creed for the noble, benevolent and compassionate cause f financing the medical expenses for the liver transplant of Nevil. Nevil and Pavil's surgery was successfully completed on 5th December. The brothers are recovering well.Pavil was discharged on 12th December and has moved to a newly rented apartment near the hospital. Nevil was moved from ICU to wardroom on 12th December. 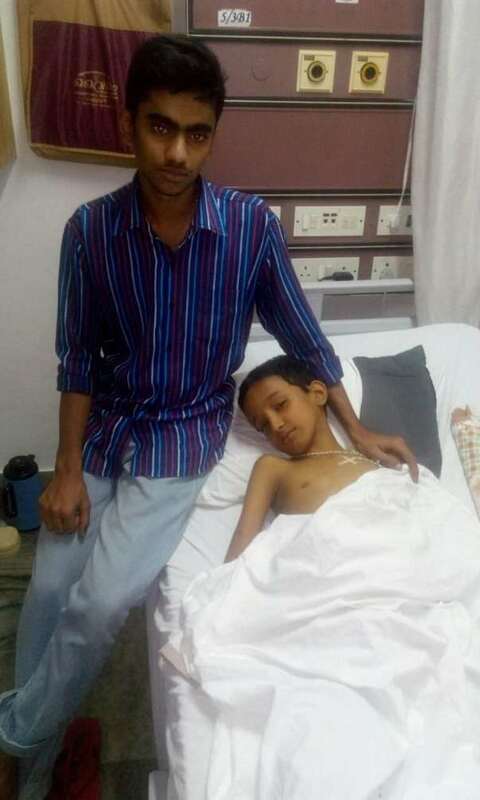 He is having slight infection and fever.Doctors have advised that it is something which is seen in 60% of transplant patients and would get better over the coming days. We once again thank you all for the great and kind gesture of your contributions. With your support through this campaign and the direct donations from other benevolent hearts the family was able to collect enough funds to meet the pre and post expenses for Nevil and Pavil. So we will be closing this campaign.